Davalos led the February 28th hike in the Oaks Bottom Habitat Restoration area, in the aftermath of the recent rehabilitation of the Oaks Bottom Lagoon and rebuilding of the Springwater Trail there. "We also hiked across the new Sellwood Bridge, read the information signs posted there, and then returned for lunch at Jade Bistro & Patisserie in Sellwood." The five hiking groups – one for each Thursday of the month – are named for the areas they frequent. There are the Mountain Troop, Northeast Troop, Washington Group, Southeast Group, and the Southwest Group. Exercise and camaraderie are their main interests. "We only have two rules," says Davalos: "No politics and no religion – we can talk about anything else. We hike about three miles on each trip." The senior hikers admired the new salmon habitats created east of the tunnel that now connects the Oaks Bottom Lagoon to the Willamette River under the new Springwater Trail segment. 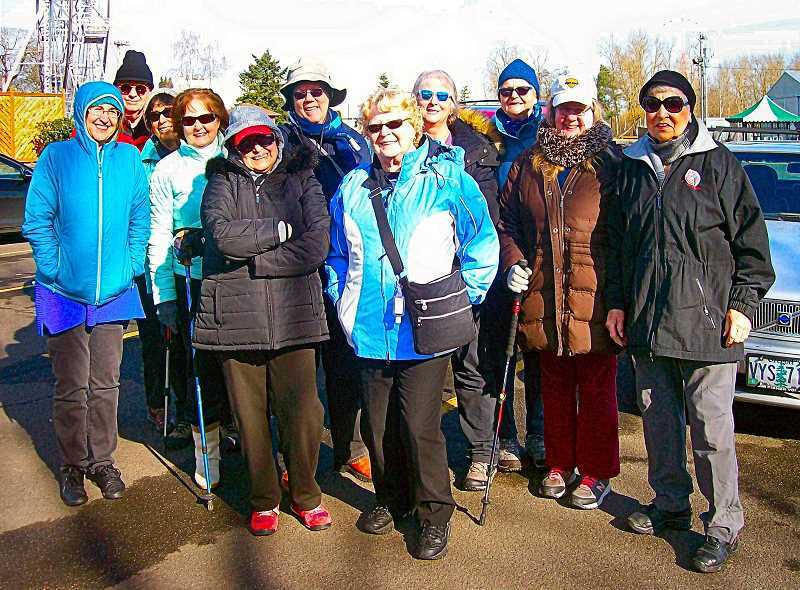 "We have a few birdwatchers among our members," Davalos commented. "One even had an app so we could listen to authentic bird calls." These 12 hikers in Oaks Bottom on February 28 saw hummingbirds, downy woodpeckers, courting wood ducks, and other wildlife. They were also impressed with close-up views of the seven-story-tall wildlife mural on the west side of the Portland Memorial Mausoleum. "Look, there's a beaver and a kingfisher," they exclaimed, taking photos of the building. The huge mural is considered to be the largest hand-painted mural in the USA.